In the winter of 2014 we flew into Dallas, rented a car and drove to Charleston, SC and back. We spent most of our time in and around the Georgia and South Carolina sea islands where the food is fantastic, the cemeteries are ancient and the lowcountry salt marshes are gold in the winter and full of birds. On the way back to Dallas, we took Highway 82 through the Mississippi Delta and spent the night in one-time cotton capital Greenwood, MS. Located on the banks of the Yazoo and the Tallahatchie, Greenwood was a major hub of cotton transport before and after the Civil War. Greenwood is looking rough these days, but the crumbling brick buildings downtown allude to past prosperity. Greenwood is home to Lusco's, the Italian grocery-turned-restaurant famous for its broiled pompano, homemade hooch and private booths for tipplers during prohibition. Lusco's was booked so we beat it across the old square to the Crystal Grill, a place similarly renowned for its seafood. A guy from Greenwood I talked with randomly on the phone at work told me he preferred the food at the Crystal. I had the crab and shrimp Newburg which was cold and gummy and needed another 15 minutes in the oven. The rolls were good. The next day was misty and after a fruitless attempt to find some breakfast in downtown Greenwood we drove out Money Rd. to Little Trinity Baptist Church where a sprawling pecan tree most likely shelters the bones of Robert Johnson among its roots. 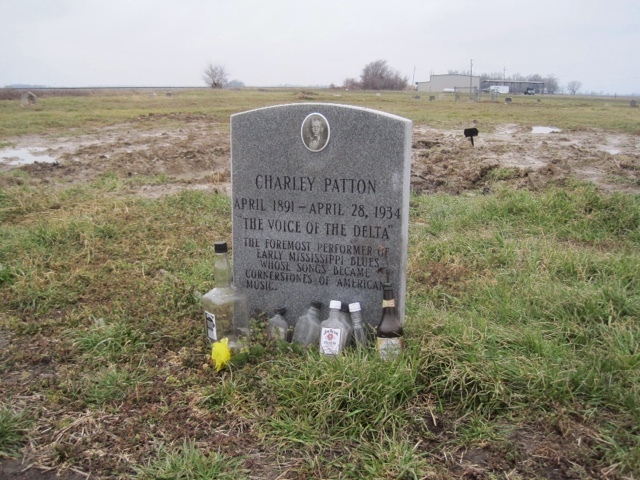 We drove over to Sunflower County in search of the grave of Charley Patton outside the tiny village of Holly Ridge. It had rained through the evening and turned the fields to an impossibly sticky beige gumbo. A "ridge" in the Mississippi Delta country is a strip of silt that is raised slightly above the flood plain and which was prime real estate for cotton planters as the land was cleared after the Civil War. There is nothing particularly ridgey about the flat plain surrounding Holly Ridge. We saw the sparse cemetery on our second pass through town. The bare, open field sits next to an old gin. There was standing water everywhere and mounds of exposed mud. It looked a little like someone had gotten a tractor stuck among the graves. A few guys sat in front of a generic house across the street, conjunto blaring. Thousands of snow geese were grazing in tilled fields on the other side of a hedgerow. As we approached Patton's grave they lifted and began to circle. We drank from a little bottle of Beam and toasted Charley. And a crop plane dropped low and skimmed a nearby field. We stopped at the Fratesi Brothers station and grocery to fuel up. It was lunchtime on Saturday and the counter was swarmed with leisurely weekenders. We got sloppy ham po boys with shredded iceberg and enough mayo to paint a Goodyear blimp. A lot of the delta gas stations have great food. We drove through bayous and over the river to Lake Village, Arkansas where we scoped out Rhoda's Famous Hot Tamales and Pies, a small building in the otherwise deserted downtown section. There were two couples inside waiting for Rhoda Adams to arrive with her mini-van loaded with fresh pies. They had just run a marathon and had a keen and ravenous look. While we also waited for Rhoda to show, we ordered a half dozen hot tamales which were fished out of a steaming 10 gallon pot by the fellow working the counter. We were still digesting our po boys so we got them to go. When Rhoda showed up, we all ambled out and she cheerfully slid open the side door. There were gasps as a dozen still warm pies were revealed. 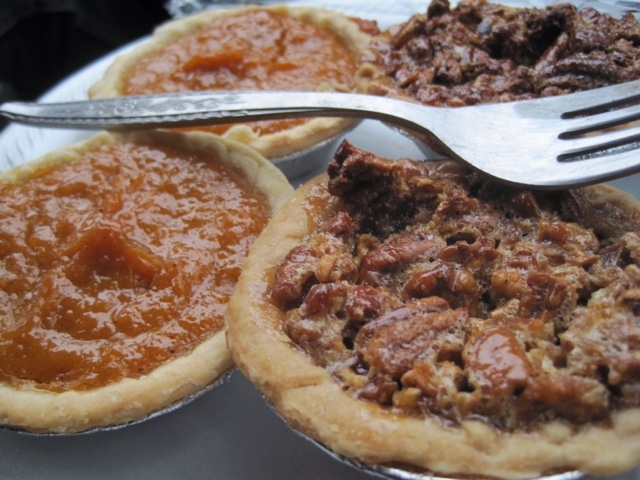 The couples snatched up something like 4 whole pies, coconut cream, sweet potato, pecan. They seemed to know what they were doing. We didn't have time to eat a whole pie and chose a mini pecan and a tiny sweet potato. Rhoda looked at us skeptically and said "now come on. You need more than that. These just came out of the oven 45 minutes ago." We explained that we had to get on a plane the next day and simply could not eat a whole pie between the two of us in 15 hours. Stupid move, on our part. The pies were beautiful, glistening, inviting. We grabbed one more of each. That turned out to be great idea. We said our thanks and as we were about to leave, Rhoda looked at us and said "Come on, bring it in," opening her arms wide. We both moved in for a three way hug. "God bless you'" she said. We immediately devoured a spicy sweet potato pie and were floored. I've never loved pecan pie but Rhoda's was of a different order somehow capturing more of the rich, buttery essence of the nut. They were packed with pecan crunch, with none of the corn syrup gel that often plagues the genre. We ate a couple tamales later for a snack in a gas station parking lot and these were likewise fabulous. We finished out the evening at an old cafeteria in Texarkana, sides of veggie and rolls.